Germany and Denmark, the most densely populated territories of the BSR, are the only parts of the region that present a rather dense and integrated network of motorways today. To a certain extent, southern Fenno-Scandia and south-western parts of Poland can be deemed to be connected to this network. Sweden and Poland, however, continue to catching up to establish interconnected motorway networks. In the other countries, most of the motorways radiate out from the main metropolitan areas (i.e. the capital areas): Oslo for Norway, Stockholm, Malmö and Gothenburg for Sweden and Helsinki for Finland, creating star-shaped patterns of motorways and highways around these cities. 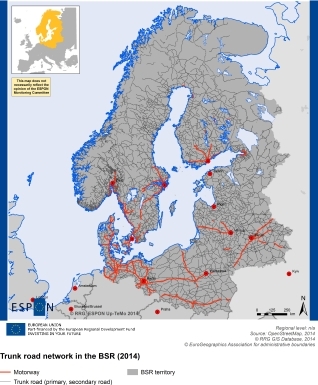 In reality so far in these countries, and in the Baltic States, no effective interconnected motorway network exists; only small sections of motorways or highways exist around regional cities, but these are not connected to a national motorway network. In the case of Sweden, it appears that the routes Stockholm-Malmö and Stockholm-Gothenburg are still disrupted, thus preventing Stockholm from being integrated into the ‘continental’ motorway network coming from Denmark. However, the recent construction of the Öresund Bridge between Copenhagen and Malmö has significantly improved the potential connection of Norway and Sweden to the rest of the European motorway network. In Poland, the situation is rather complex. Two separate motorways link the main central Polish cities with Berlin. The routes Berlin-Poznan-Lodz-Warszawa and Berlin-Wroclaw-Katowice-Krakow thus enhance the potential for interactions between Poland and Germany, and more generally the integration of Poland with the populated areas of North West Europe. A highway also connects Katowice-Krakow with Warszawa, heading northwards as motorway towards Gdansk. What is interesting in the Polish case is the lack of large road infrastructures (motorways) dedicated to intra-national connections. This results in fewer opportunities for regional integration within the country, whereas on a national level, the largest metropolitan areas are connected to external markets. In the rest of the country only scattered trunks of motorway/highway networks exist. In the Baltic States, high capacity road sections are concentrated around the capital regions, however, connections between other urban areas and the capital regions are not effectively provided, though Lithuania does have a motorway connecting Vilnius and Kaunas with the seaport of Klaipeda. The Baltic States also lack high-quality road networks in a north-south direction (connecting the three Baltic states with each other), as well as high-quality East-West links connecting the three countries with Russia. In Kaliningrad and North West Russia, few roads have sufficient capacity to be considered as motorways. However, a few sections of motorway do exist around the city of Kaliningrad and St. Petersburg in the direction, respectively, of Gdansk and the Finnish border. In Belarus, the road connecting Minsk to Poland and Moscow is partially highway within Belarus. However, this specific road capacity is not pursued in either Russia or Poland.